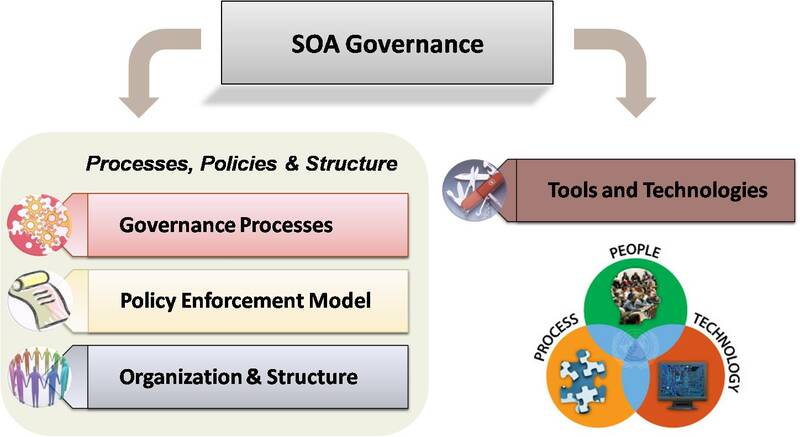 SOA Governance has two dimensions. First – the processes and methodologies used. Second – the tools and products used for governance. Quite often, people assume that the purchase of a SOA Governance tool would suffice for implementing SOA Governance. 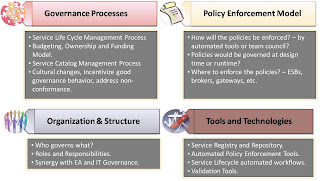 But the fact is that the tools would only help in automating certain enforcement policies and service lifecycle workflows. What is first needed is a framework of processes, policies and organization structure to be defined. Any governance process needs to embrace the trilogy of “people, process and technology”. The following diagram illustrates this point and states the various activities that need to be done for implementing SOA Governance. 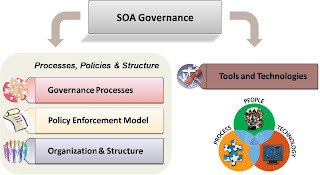 The Open Group has also published a SOA Governance Framework that can be accessed here.